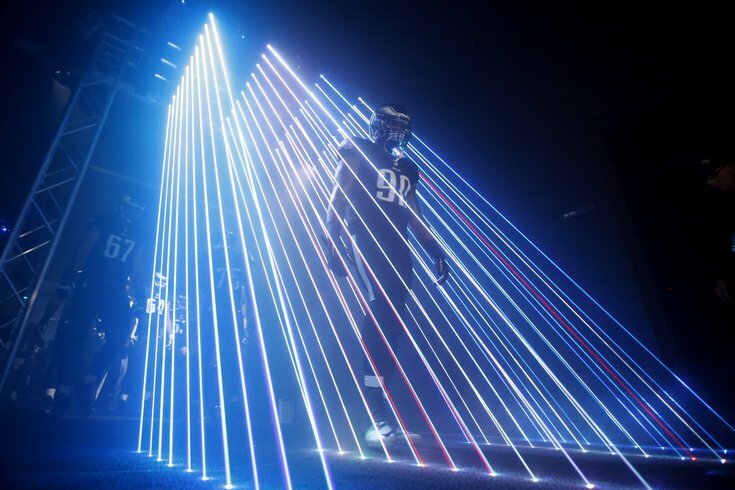 Philadelphia Eagles linebacker Marcus Smith walks through the tunnel and onto the grass at Lincoln Financial Field. Philadelphia Eagles linebacker Marcus Smith hasn't had an ideal start to his NFL career. And in his own way, the former first-round pick is doing his best to improve his situation and shed the scarlet label that's been pinned on his jersey for over a year now: NFL Draft Bust. But Smith doesn't have to do it alone. There's a blueprint for him turning his career around, and it's right in his own locker room. In fact, he doesn't even have to look outside his own position. Don't forget, it wasn't too long ago that Brandon Graham was a punch line. He was used as an indictment of Howie Roseman's ability to evaluate talent. When he was taken 13th overall in 2010 instead of All-Pro Earl Thomas, Graham was pointed to as a reason why the Eagles were unable to immediately replace legendary safety Brian Dawkins -- even though he had very little to do with where he was drafted. He was labeled a bust, even by himself, despite the fact that he missed almost all of his second season with a torn ACL. And then, Chip Kelly arrived. Just as Graham had seemingly adapted to playing 4-3 defensive end at the NFL level, the new Eagles coach arrived with a different system. He also added Connor Barwin and drafted Smith, both of whom play the same position as the former Michigan standout: outside linebacker. As a result, Graham went from splitting time at defensive end to barely getting on the field in his first season under Kelly, playing just 26.1 percent of the defensive snaps (according to footballoutsiders.com). In fact, he played nearly as many snaps on special teams (288) as he did on defense (323). The year before, Graham was on the field for 40.2 percent of the defensive snaps (421), and just 4.2 percent of the special teams plays (19). Each year, however, despite reports that he was on the trade block, Graham continued to improve. And the more comfortable he seemed to look in Kelly's system, the better he played; the better he played, the harder it became for Kelly to keep him off the field. By 2014, Graham had surpassed the highest usage rate of his young career and was playing 43.1 percent of the defensive snaps. He also set new career highs in tackles (35) and forced fumbles (4) and tied his career high with 5.5 sacks. As a reward, the Eagles re-signed Graham to a four-year, $26 million contract last offseason. This season, now the starter alongside Barwin, the sixth-year linebacker was on the field for 71.7 percent of the snaps and set new career bests in tackles (39) and sacks (6.5). "You can say it as much as you want, but I know in my heart that I won’t be [a bust] and that I’m going to make it in this league. I’m going to be a great player in this league." Needless to say, Graham is hardly looked at as a bust anymore. All this brings us back to Smith, a guy many thought would replace Graham on the outside when he was drafted in the first round of the 2014 draft, the year before Graham signed his new deal with the Birds. After two full seasons with the team, Smith has found himself in a similar position to the guy who now starts in front of him. “I’ve heard [people call me a bust] a lot," Smith said Monday, a day after their season reached its 7-9 conclusion. "It don’t bother me though because it’s just a word. You have to play this game — and we’re the ones out there playing, so it really doesn’t bother me much. You can say it as much as you want, but I know in my heart that I won’t be [a bust] and that I’m going to make it in this league. Smith played well on Sunday and saw more action than he had become accustomed to under Kelly. The Louisville product recorded the first solo sack of his career and put pressure on Eli Manning a few other times. For the young linebacker, it was a nice way to cap off what he called a "rough" start to his NFL career so far. Overall, however, Smith's career to this point has not been what many were hoping when the team selected him 26th-overall -- much like Graham's was early on. Wisely, Smith has sought the advice of his older teammate. Unfortunately for Smith, Graham's improvement is part of the reason he hasn't been able to get on the field as much as he'd like. And although the Eagles will have a new coach next season, the 23-year-old doesn't think that alone is a reason to be hopeful his playing time will suddenly increase. So while that time -- being a starter -- has yet to arrive for Smith, he continues to battle. He has also continued to learn. From his teammates. From his coaches. And even from the things that don't go his way. “I just learned that adversity is going to always be there. Adversity’s been coming throughout my whole life and the first two seasons have been a lot of adversity. But at the end of the year, at the end of the day, I feel like through god all things are possible and going out on top in the last game just showed that.